We are a top notch supplier of Collar Fusing Machine. 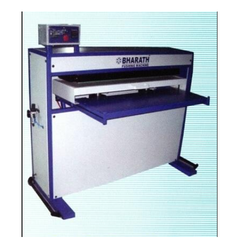 working area: 1 m x 1/2m, 20" x 40"
We offer superior quality Collar Fusing Machine to our clients. These are manufactured using superior quality raw material to offer an outstanding range of machines. Our products are in compliance with set industrial standards. These are developed at our testing unit which is handled by our quality analysts who vigil our products at each stage from procurement to final dispatch. In order to meet excellent quality standards, we are supplying Collar Fusing Machine. We are engaged in offering Collar Fusing Machine. From our wide consignment, we are affianced in supplying Collar Fusing Machine. We are a top-notch organization, engaged in providing Collar Fusing Machine. So as to furnish the ever-growing desires of our patrons, we are engrossed in delivering a comprehensive variety of Collar and Cuff Fusing Machine.